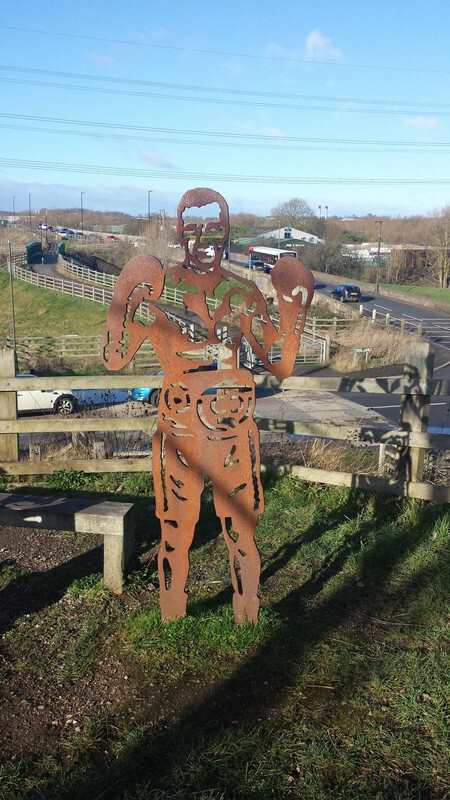 See if you can pick this up sometime Mr Gee ..
Not the easiest read by any means but it's a fascinating insight from a survivor if the atrocities. .
Boxing sculpture near Rother Valley Country Park ..
Is there anyone out there? very , very quiet on the forum, is there any particular reason? or is the forum just dying off? The forum was just down for a couple of hours, making a number of updates in the hope we are the opposite of "dying off"! Hi mate. I don't blame Marie for one minute. I know you are not a fan but I wouldn't miss The Voice for anything. However I dd the opposite, watched the rugby and boxing and recorded Voice. Friday night I watched Wales beat France. What a magnificent comeback. Pleased for all the Welsh lads, in particular my favourite Alun Wyn,and Warren Gatland in his last year. They are gonna be a hard team to crack particularly on home ground. As you'd expect I was chuffed to see England beat Ireland. Didn't really expect that as I thin k Ireland are still a great team and won't be going away just because of one loss. To a man England were terrific though, and in some small way Jones was vindicated. People can say what they like but the man has held his nerve through some bad patches. Disappointed young Maro got injured. He's a great player but I'm guessing could be out a while. Small consolation is theres some good alternatives. Saw the Cheesman bill, thought he should have been pulled out around the 8th. Recorded Boxnation will watch today. PS I thin k it will be a VERY tough one for England away to Wales. France no walk in the park either next weekend. Fantastic couple of games of rugby and the standard they play at now every game is won on fine margins the physicality of England was great to see as they really tore into Ireland from the off,well done again to Boxfan's nephew who was as always a solid performer. Mervyn,agree with you on Cheeseman,brave corner men to me are actually the ones that tap a fighter on the shoulder and say you have had enough,how one judge had TC losing by only a point was ludicrous. He can come again but be it Euro/British level he wasn't in with a banger last night and that would be the worry for me more than anything,very easy to hit.